Singer and guitarist Billy Taylor (ex-Inglorious) of the single “It’s great to be writing in a completely unrestricted style and environment again. We aren’t writing to please anyone, we’re writing and recording what we’d like to hear. ‘All Come Running’ is great fun to play and hopefully it’s just as fun to listen to! Tony Draper has done an awesome job engineering and mixing this stuff and we can’t wait for everyone to hear more!" 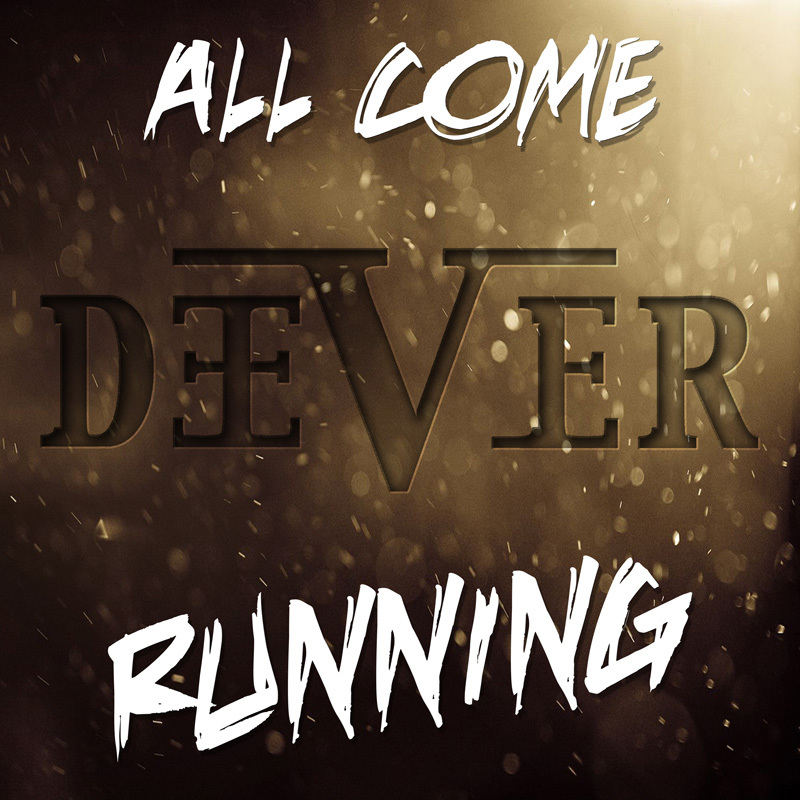 Deever is a modern hard rock band that has rock fans talking all over the United Kingdom. Hailing from the northeast of England, Deever deliver an onslaught of aggressive riffs, and captivating hooks with a distinct British edge. The fresh music of Deever packs a powerfully tuneful punch to the ears of their listeners. After writing, and releasing two albums with his previous classic rock outfit (the second of which made it to number 1 in the official U.K rock charts), Billy Taylor (ex-Inglorious) decided to construct a band with a sound more fitting to his own more modern taste. With influences including Foo Fighters, Alter Bridge, Muse and Shinedown; the band has developed a fresh spin on the rebellious modern rock sound with their infectious melodies. As with his prior band, Billy Taylor once again brings his guitar prowess to Deever, but also steps forward as Deever’s assailable lead vocalist. Joining Billy on guitar, and as a backing vocalist, is the fiery play of Stevie Stoker. 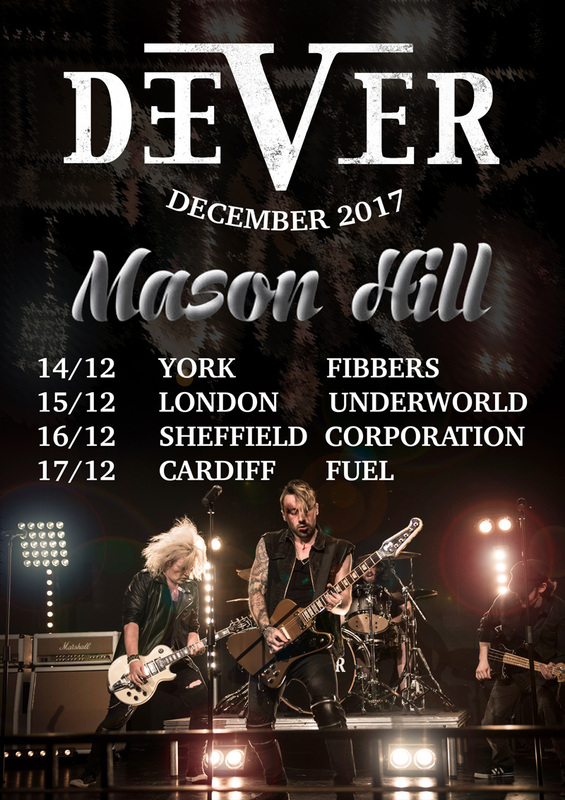 Phil Appleton provides the band’s rigorous rhythm and grooves on bass, and rounding out Deever’s line-up is the thunderous playing of Dan ‘Higgy’ Higgins on drums. To officially launch the band, Deever have released their first single, and music video for the song ‘Fire At Will’. In celebration of INGLORIOUS “II” UK Chart entry ( #22 in the official album charts and #1 in the Rock charts) the band are pleased to release the brand new video for “Taking The Blame”! Frontiers Music Srl are pleased to announce the release of the second Inglorious album, “Inglorious II”, on May 12, 2017! The band have also announced their new guitar player. 2016 was a stunning year for UK five-piece Inglorious. Their eponymous debut album was released through Frontiers Music Srl in February. The album received widespread critical acclaim at press, multiple A lists at radio and a lauded performance on Vintage TV. The band toured across the world, with numerous high profile shows in the UK and Europe – including show stopping performances at Download Festival 2016 and Ramblin' Man Fair 2016, support slots for The Winery Dogs and The Dead Daisies, and culminating with a support slot for Steel Panther’s European Arena tour in October and a co-headline UK tour with label-mates Last In Line in November 2016. Inglorious Announce New Studio Album For 2017, Produced by Kevin Shirley (Led Zeppelin, Aerosmith, Bon Jovi). UK Dates Scheduled For Nov & Dec 2016. 2016 has been a stunning year for UK five-piece Inglorious. Their eponymous debut album was released through Frontiers Music Srl in February. The album received widespread critical acclaim at press, multiple A lists at radio and a lauded performance on Vintage TV. The band are managed by QEDG (Yes, Asia) and booked by Steve Strange at X-Ray (live agent for Coldplay, Eminem and Queens of the Stone Age). The band have toured across the world, with numerous high profile shows across the UK and Europe ' including a show stopping performances at Download Festival and Ramblin' Man Fair, support to The Winery Dogs and The Dead Daisies, and culminating in support to Steel Panther's European Arena tour in October 2016. September 2016 saw the band base themselves in Liverpool and work on the follow up studio album with legendary producer Kevin Shirley (http://www.cavemanproductions.com/biography.html). Set for release in 2017 on Frontiers Music Srl, the album is set to further push the rise of this remarkable band. Formed in February 2014, the band is fronted by Nathan James, who made a name for himself having sung for the multi-platinum selling Trans-Siberian Orchestra, and Scorpions guitar legend Uli Jon Roth. Nathan was looking for like-minded musicians that desired to make incredible rock music in a very honest fashion. For the debut album, Nathan thought to himself, 'Why are those classic albums so awesome?' He realised it was because 'the musicians were recording in an organic way; they could track it live and capture amazing energy." The band is lineup completed by rhythm guitarist Wil Taylor, lead guitarist Andreas Eriksson, bassist Colin Parkinson, and drummer Phil Beaver. Wil, from the Northeast of England, is the youngest member of the band whose heroes include Mark Tremonti (Alter Bridge), Joe Satriani and Steve Lukather (Toto). The same albums that have inspired generations of musicians and performers are noticeably evident when you listen to the Inglorious debut album. This is the music they were born to play together - inspired by bands in the classic rock genre as diverse as Deep Purple, Led Zeppelin, Whitesnake, Bad Company, Aerosmith and The Rolling Stones, to name a few. This British band are hailed as the heirs to the classic rock throne, as currently held by the likes of Deep Purple, Whitesnake and Rainbow. Fronted by one of the biggest voices in rock today, Nathan James dominates this recoding with some truly remarkable vocal acrobatics. From a deep booming baritone to high pitch wailing and everything in between, he is all over this material like few others I can recall in recent times. The style of James can be something that requires adjusting to – when you have such a unique voice, there will be some that don’t connect – but then he so suits the material here it doesn’t take long to warm up to him. Think Richie Kotzen meets David Coverdale. But he isn’t the lone star here – the performances within this album from the band are quite special. There’s a certain organic energy that radiates from this record, yet at the same time, the production seems quite polished. The twin guitar attack is relentless and the rhythm section delivers the thunder to the lightning of James’ dominant vocals. I love the production on this album. It’s sharp, it’s crisp, but it is also warm and inviting. A lot of time and went into this record and it shows. What I struggled with to start with was the pacing of the album (yes, the tempo strikes again) and that issue remains as the only hesitation here. While this album has a penchant for slower songs, most of them work. I’d prefer a couple more ‘up’ tunes, but the quality of the performances and the songs themselves make up for this and dare I say that those that have an ear for the slow and moody will absolutely love what’s on offer here. After a build-up that would rival Rainbow and Deep Purple for mood and anticipation, Until I Die storms to life. It’s a mid-tempo hard hitting rocker with a terrific Zeppelinesque groove. Breakaway is a storming fast paced Rainbow/Purple style rocker with organ and screaming vocals – everything you could ask for. High Flying Gypsy turns the tempo back a notch, but is driven by a big riff and some nice soloing. The vocals wail of course. Holy Water is utterly brilliant. The slow tempo suits the mood and all I can hear is classic Deep Purple or Coverdale here. It’s just immense. James electrifies with a really soulful vocal. It’s very Richie Kotzen and sounds like it could come from any of his solo albums. It’s a classic 70s swagger-n-blues tune. Very cool and the chorus is simple, but high impact. Warning takes a while to kick into high gear, but once rolling, delivers a wailing tempo boost when needed. The twin guitar attack delivers riffs in both ears while the production is just perfect and James’ vocals are brilliant. Bleed For You is the third slowish tune in a row, which would normally test my patience, but its simply too good a song to worry. It’s a heavy ballad of sorts, the vocals are once again quite extraordinary. Girl Got A Gun is the same slow pace again, perhaps this is one slow track too many, but the chorus comes to life and it’s still a very good song. You're Mine stays within the album’s overall mid-pace tempo. This is a bit of Zeppelinesque number. It’s a decent hard rocker with more Kotzen familiarities with the vocals and some touches of Coverdale too. Inglorious is a heavy, slow rocker with another Zeppelin influenced 70s riff and some variety within the song, but overall it’s slow once again and the album could really use a lift in tempo. Wake isn’t it. The song is an acoustic ballad with a lot of class though, a really big soulful vocal again from James. Unaware is a heavy but melodic heavy groove that is for me probably missing a stronger chorus. The first half of the album is flawless as far as I can see and the second half still sounds amazing, but suffers from lack of pace and a couple of songs that match the outstanding quality within the first half. It all comes down to the tempo – only 1 or 2 really fired up, fast paced tracks. More would have been preferred, but at least the songs are consistently good. The album pays homage to the artists mentioned as influences and Nathan James is a monster vocalist with a strong Richie Kotzen / David Coverdale vibe. The rest of the band are no slouches either – dynamic performances all-round and a very convincing debut. So Inglorious are the new hope for British classic hard rock. We’ve already got several bands doing the classic 70s rock thing (The Answer, Rival Sons, Black Star Riders), but no one that’s really doing the whole Deep Purple, Whitesnake, Bad Company, Aerosmith vibe which is what these guys state as their primary influences. And it works. Formed in February 2014, the band is fronted by Nathan James, who made a name for himself having sung for the multi-platinum selling Trans-Siberian Orchestra, and Scorpions guitar legend Uli Jon Roth. The debut album has a monster classic rock production, especially with the rhythm section constantly bombarding you. James is pretty much everything you’d expect from a frontman hyped as an upcoming great. He has some immense lungs. 02.Breakaway is a storming fast paced Rainbow/Purple style rocker with organ and screaming vocals – everything you could ask for. 03.High Flying Gypsy turns the tempo back a notch, but is driven by a big riff and some nice soloing. The vocals wail of course. 04.Holy Water is a slow bluesy rock tune, with a really soulful vocal. It’s very Richie Kotzen and sounds like it could come from any of his solo albums. It’s a classic 70s swagger-n-blues tune. Very cool. 05.Warning takes a while to kick into high gear, but once rolling, delivers a wailing tempo boost when needed. 06.Bleed For You takes us back to a slow tempo. It’s a heavy ballad of sorts, the vocals are quite extraordinary. 07.Girl Got A Gun is the same slow pace again, perhaps up a notch for the decent chorus, but a bit slow. 08.You're Mine lifts the tempo slightly more again – we’re at mid-pace now. A decent hard rocker with more Kotzen familiarities with the vocals and some touches of Coverdale too. 09.Inglorious is a heavy, slow rocker with a good riff and some variety within the song, but slow again. The first minute of Unaware is a slow piano intro before it fires up into a heavy but melodic heavy groover. 11.Wake is an acoustic ballad to close out, with a really big soulful vocal again from James. So that’s the album. It certainly pays homage to the artists mentioned as influences and Nathan James is a monster vocalist with a strong Richie Kotzen / David Coverdale vibe. The rest of the band are no slouches either – dynamic performances. Very convincing for a debut. It all comes down to the tempo though – only 1 or 2 really fired up, fast paced tracks. Much more listening over the next week to see how the songs grow and last with me. On taking a break from the music industry: "I had been touring for about twenty years with the Scorpions. I just needed some time off to look after my family, but the main reason was a disagreement within the band about management, about the future and about the past.. I didn't feel comfortable with the new people coming in." The SCORPIONS 50th Anniversary re-issues and bonus interviews: "I knew about the interviews because Herman told me, but the record company just didn't want to invite me and I didn't want to run after them." On Jimmy Bain's passing: "Very sad news... I was very sad about that. He's a lovely guy." In the episode's second interview, Mitch sits down with upcoming singer Nathan James from INGLORIOUS. The two discuss the band's self-tiltled debut album, Nathan's career up to this point and being the singer on Uli Jon Roth's Scorpions Revisited album, and much more. Quote from the interview: On getting into a band situation rather than move forward as a solo artist: "It's what I've wanted to do for a long time. I started recording a solo record with some amazing musicians. It was a great sounding album, but I was listening to it and I thought, 'I'd rather be Robert Plant than Meatloaf'." On the heels of the success of the first track 'Breakaway', which immediately found its way in UK's Planet Rock Radio Charts, INGLORIOUS release a video for their first proper single 'Until I Die'. The song is taken from the UK outfit's self-titled debut album, out on February 19 via Frontiers Music Srl. The album can be preordered on iTunes: http://radi.al/Inglorious and on Amazon: http://radi.al/IngloriousAmazon now, with those buying ahead of launch getting 'Until I Die' and 'Breakaway' instantly. QUEEN's Brian May has recently given frontman Nathan James, bassist Colin Parkinson, drummer Phil Beaver and guitarists Will Taylor and Andreas Zata Eriksson his seal of approval after hearing some of the band's material. INGLORIOUS are being hailed as one of the UK's heaviest new hard rock bands to emerge from the British underground scene. Originally formed in February 2014, the band is fronted by Nathan James, who made a name for himself having sung for the multi-platinum selling Trans-Siberian Orchestra, and Scorpions guitar legend Uli Jon Roth. Inspired by musical giants such as Deep Purple, Led Zeppelin, Whitesnake, Bad Company, Aerosmith, the band's song Breakaway has already found its way on to UK rock radio. Inglorious are joining The Winery Dogs as their Special Guests on the Double Down European tour - including 4 UK shows. The tour starts in Cologne on the 29th of January and the bands final show will be the 17th of February in Budapest, A few days before the London album launch showIslington Assembly Hall Ticketmaster and the bands first headline UK tour. You can pre order the album on iTunes and Amazon.com now. Release date 19th of February 2016. A message from Nathan James.